Updated! House to House documents how God transformed a small fellowship of young believers into a worldwide movement. DOVE International® grew from 25 people to a cell church of over 2300 and then transitioned into a family of small group churches and house churches networking together throughout six continents. 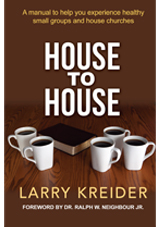 Larry Kreider draws from thirty years of victories and defeats to provide an overall paradigm with which to “do” church, where every believer becomes a minister. To embrace this paradigm, the very core of what drives and moves the church is changed. It is not about being clergy run, but rather, church leadership exists to equip and release the believers to become the ministers through small groups and house churches and fulfill their God-given call. The book’s view of small groups and house churches, based firmly on the scriptures, from their purpose of reaching people for Christ to making disciples to their impact on today’s world, will inspire believers, Christian leaders, and churches, traditional or contemporary, in years to come…transforming them from individual congregations, large and small, into church planting movements. Includes study and discussion questions after each chapter. Use it as a handbook for small group and house church dynamics as well as an invaluable tool to train leaders.